Ever since I can remember, I thought of creativity as a personality trait. I thought that some people are simply creative, and some aren’t. When I was in elementary school, I loved art lessons but I was always jealous of my friends who could paint and draw very well; I always thought that I just wasn’t as creative or talented as them. I didn’t get it- my mom studied art for a while and she has a huge talent when it comes to things like drawing, just creating beautiful things out of nothing, decorating. Surely, I thought, I must have “inherited” some of that talent? It wasn’t until I read Big Magic by Liz Gilbert, when I realized that we’re all creative beings. I can be creative in the way I write, cook, photograph. You can be creative in the way you dress, the way you solve your problems, the way you raise your kids, the way you do your makeup or the way you decorate your home. Point is, we are all born to be creative, to be free to explore, free to embrace our curiosity. It doesn’t matter if you’re an artist, an attorney, a construction worker, a stay-at-home mom, a mail carrier- you can use your creativity to bring some sparkle and fun back into your life. Maybe there is something creative that you loved doing, but you’ve stopped, because you no longer have enough time, or you simply forgot how much fun it used to be? For me, It’s probably playing the violin. It’s been sitting somewhere in a closet in our guest bedroom, collecting dust. Every weekend I tell myself, “I’ll play next weekend when I find time” and I keep putting it off, time and time again. Creativity isn’t something that you either have, or you don’t. It’s something that’s acquired, and the more you exercise it using different exercises and techniques, you’ll find more innovative solutions to your problems, you’ll have a ton of different, fresh, new ideas. You can do this even when sitting down on your couch in your living room. Look around the room, and find three objects. Found them? Okay, now look at those three objects and create a story that somehow connects those three objects- the story doesn’t have to be good. For example, right now I’m looking at a lamp, a metal owl statute and a glass of water. I can see that owl as once being alive. She flew into this room through an open window one night. As she was sitting on a window sill, she noticed a glass of water sitting on a table. She decided to fly over and get a drink. As she was sipping on water, she noticed the lamp and looked right on it- she then froze and turned into metal. See, that lamp is magical- it turns anything and everything that looks right in its light, into metal. Every night, as the lights turn off, the owl comes back to life and flies over to the window sill, hoping the window would be opened so that she can fly away. Like I said, the story doesn’t have to be good, but this will help you exercise your creativity. The cool thing about this exercise is that you can do this pretty much anywhere- when sitting outside, when you’re in a waiting room somewhere, even when you’re stuck in traffic. This is a fun thing to do with your kids too and it’ll help them exercise their curiosity as well. 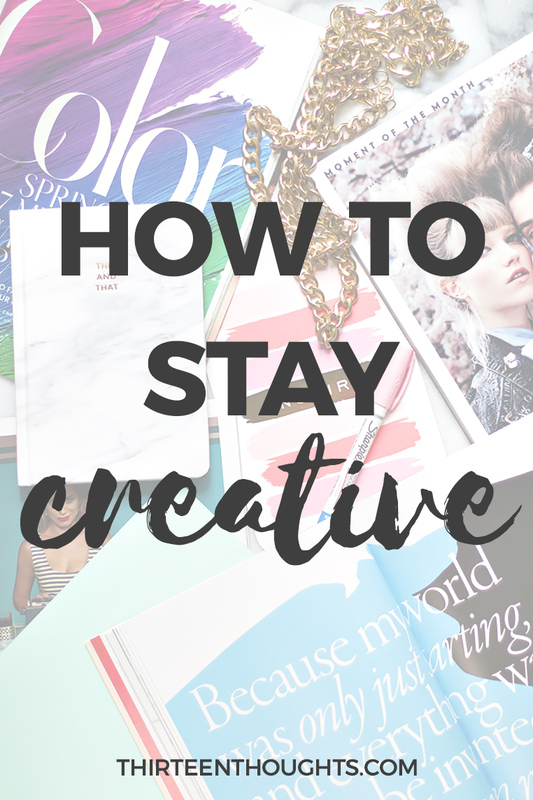 If you’re a writer/blogger reading is probably one of the best ways to boost your creativity. I’m a big believer that in order to become a better writer, the first thing you need to do is read. A lot. Everything. 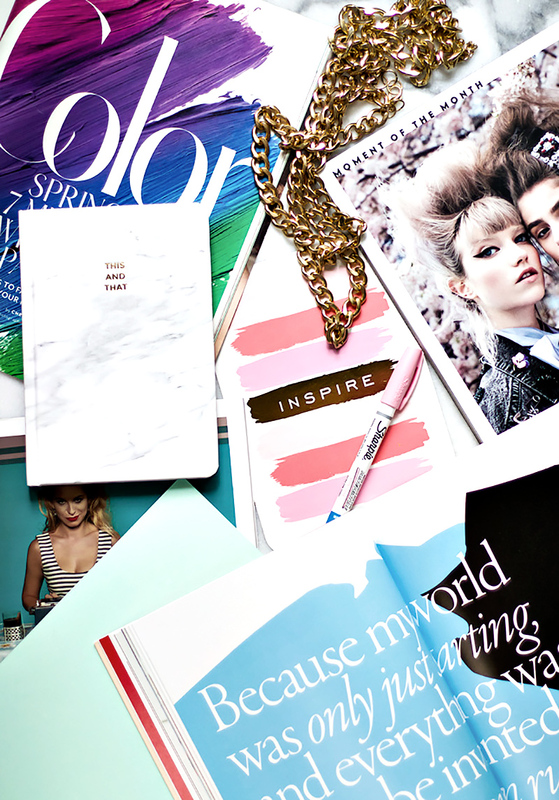 Magazines, books, blogs. The more you read, the easier writing will become. Your vocabulary will become richer, you’ll remember words or phrases you’ve forgotten, you’ll find it easier to find your own style of writing. Just read. Sometimes, I can sit down with my laptop, and write a long post in fifteen minutes. Other times, I spend hours writing, changing, erasing and basically not getting anywhere with my posts. I find that one of the best things to do whenever I have trouble writing, is reading. I’ll read a book for an hour before sitting down to write a post, and writing always comes much easier. I am a creature of habit and for a long time, I really didn’t like trying new things. For years, my husband has been pretty much forcing me to try new things- like snowboarding, skydiving, hiking, kayaking, going out to new restaurants and bars, watching films I’d never watch. Every single time I protested because I am a creature of habit. I like being in control and at times I find letting go of that need to control everything around me to be very difficult. So, when you put me in a situation where I can’t control anything (like my environment) I get nervous and anxious. But something else happens as well- after a while, I start to enjoy myself. I notice that when you let go and start saying “yes” to more things, life can actually be pretty fun- that’s how you grow. After we made it through to the shore I felt so proud of myself (mostly for not drowning or being dragged to the bottom of the river by some evil creature living down there- this is what my worst nightmares are made of, guys) and I thought, you know what, this can apply to life, too; life gets “choppy” at times, just like that water did, but as long as you look ahead and don’t let it scare you and freak you out, you’ll make it and you’ll get to your destination. 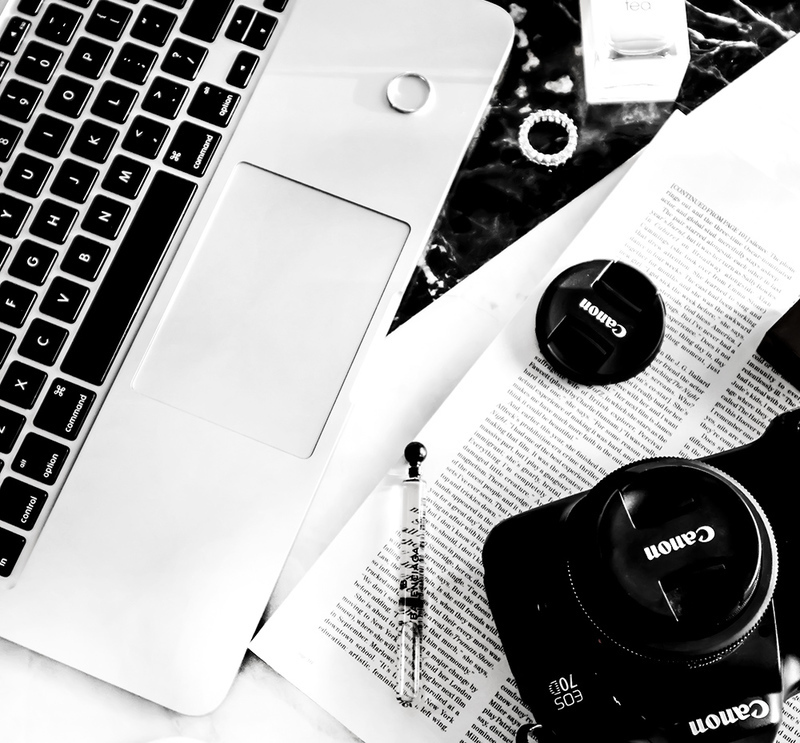 I really wanted to share this story on my blog, but at that time I didn’t really have any category that would be fitting- so, that day, I decided to start writing “girl-talk” posts where I’d share some of my own struggles and how I’ve overcome them. Even though that story never made it on the blog, creating the category turned out to be a great idea and I constantly get comments and messages from you guys, saying that those posts are your favorite. So, while going kayaking had nothing to do with blogging, it inspired me to create something new. I learned something new by doing something that I was scared of. Trying new things can really change your perspective and you too can learn new things about yourself. Turn off your TV, your phone, your laptop and get outside. Go for a run, or for a walk, or just grab a blanket, lie down on the grass and look at the sky. Look at the trees, the clouds, the birds. Disconnect for a little while. If you have a little time this weekend, go out for your morning coffee, instead of having it at home. If you always work on your laptop by your desk, maybe try working in a new spot- in the kitchen or even in your backyard. Changing your surroundings is another great way to boost your creativity. When you see and do the same things every single day, your brain simply starts to feel too comfortable. When you’re in a new setting, exposed to new things, experiencing and seeing something different, your brain releases dopamine- a neurotransmitter that is linked to creativity. If you start feeling like you’re in a creative rut, try to switch things up a little. Psychological distance, that is. According to Construal Level Theory of psychological distance, anything that we do not see as being near, experiencing as occurring now and here, is “psychologically distant” to us. There are many studies that prove that psychological distance affects our creativity. But what exactly does it mean? Imagine a wizard. What does he look like? He’s probably wearing a cloak, a pointy hat and carrying a wand. Now, increase your psychological distance, by imagining a wizard, that you think someone you know would imagine if given this task. What does your wizard look like now? The idea of creating that psychological distance is to change your perspective, change the way you think about your task. Now, you can further increase that distance by imaging your wizard as you think someone who lives across the world would imagine him to look like. Increase that distance even further, by changing a time distance- let’s say that the wizard lived 300 years ago. What does he look like right now? Chances are, he looks very different from when you first imagined him. Next time you’re solving a problem, working or just need to get those creative juices to flow again, try to change your perspective and create that psychological distance between yourself and your project. The greater the distance you create, the more creative solution you come up with. What do you do when you’re in a creative rut? In what ways do you think you’re being creative in your everyday life? ….and trust me, you are, even if you don’t think of yourself as a creative person.